Departing Suffolk & Essex - ALADDIN is an extraordinary theatrical event you will want to be amongst the first to experience. 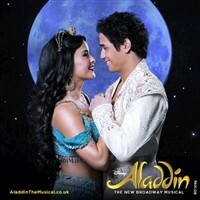 Disneys spectacular musical Aladdin is everything you could wish for and more, and is dazzling audiences daily at the beautiful Prince Edward Theatre, in the heart of LondonsWest End. The classic hit film, hugely successful on Broadway, is brought to thrilling life on stage by the producer of The Lion King, featuring all the songs from the Academy Award©-winning score, together with new music written for this production.